My earliest memory of Gafar must have been either in the first or second standard, running on the foot-path in front of our home in Colaba. He would grab and hurl me up in the air. As I screamed, he would gently let me down. Tentatively I would ask him to do it again, … and again. Gafar tends this little hosiery stall in front of our building. At the start of every school year, all of us cousins would buy our socks, handkerchiefs, banyans and underwear at his stall. Even though his stall appears tiny, he had everything any of us needed. He knew our sizes, and would reach up and pull out a box from the shelves. It was always the right box with the correct things we needed. As we moved away to College, every visit home included a trip to his stall to stock up on necessities. 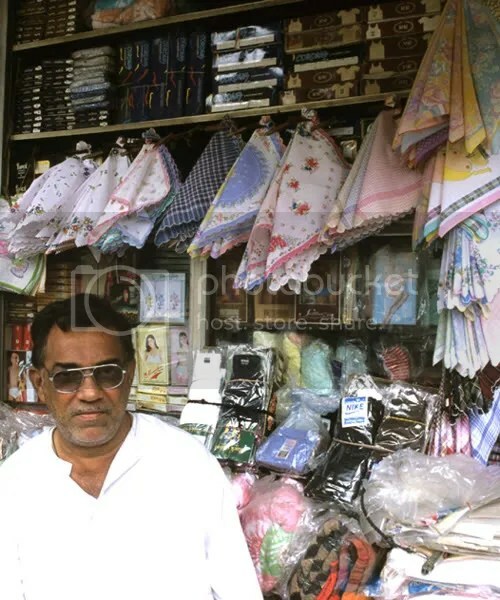 Even now when I visit India, I stop by his stall and buy banyans and handkerchiefs. Now I don&apos;t lose my handkerchiefs as often, but I still pick up a dozen of the finest on every visit. I now probably have 3 or 4 doz sitting in my closet. Its become a tradition now! If you walk around Colaba Causeway, you may see him standing in front of his stall. Or maybe sitting on the wooden stool in front, or maybe sipping a chai. Give him my Salaam, and buy a few handkerchiefs.